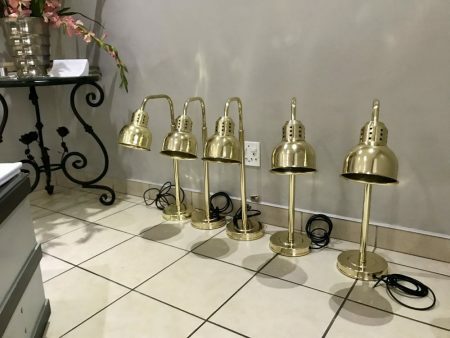 These striking brass plated food heating lights has pleased yet another appreciative Client who will extensively utilize them for the purpose temperature control of meal servings for its Clients. The lights measure 670mm high x 220mm c/c as per Client’s specification it can, however, be fabricated to suit any desired specification. The base is spun from 0,8mm mild steel and provision is made for containing a lead weight for stability. The lamp shade containing the lamp holder is also spun from 0,8mm mild steel. The upright and “U”- bend are made up from 25mm and 16mm mild steel tubing respectively and the swivel adaptors are lathe machined brass. All the components have been classily assembled and brass coated. Copper or Rose Gold coatings are also available.